I sat in the back row of the auction house, my hands clammy as I turned the pages back and forth in the sale catalog. I was going to do it, actually do it. 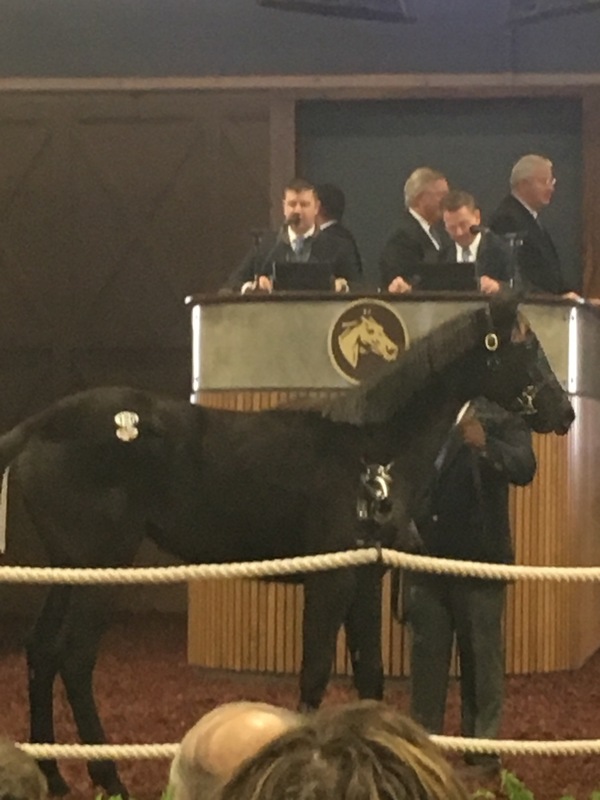 In four horses, they were going to call Hip 125, and I was going to raise my hand and actually bid on one of the yearlings I had been looking at in the barns behind the sales pavilion. If you have been following my blog, you know I had attempted to breed my own Thoroughbred. This had not gone according to my plan. 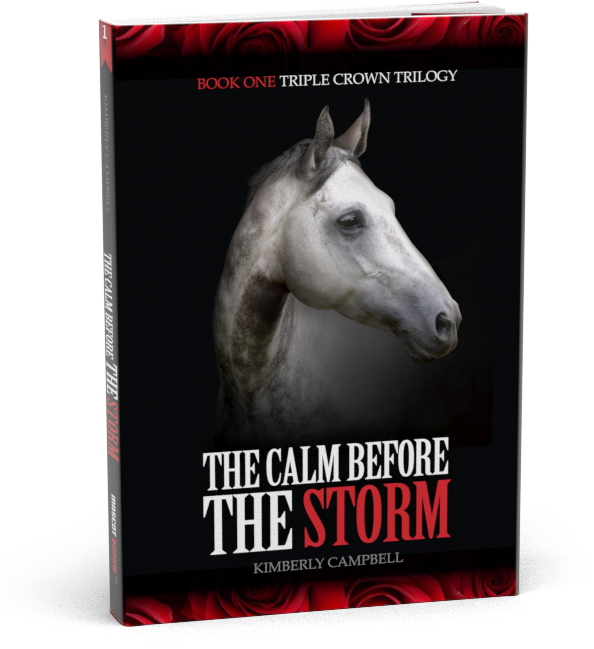 The path started in 2015, when I shipped my show mare to a Thoroughbred breeding farm. The first try didn’t work, so Lilly spent the year retired from showing, getting fat and happy in a field. In 2016, we were successful in breeding her to the stallion Tritap. Sadly, in October Lilly aborted the foal. For the last four months, I’ve been contemplating my next step. 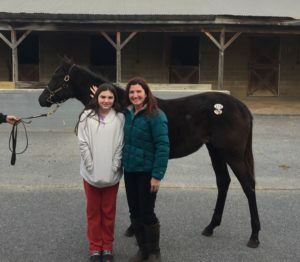 Should I even continue this crazy dream of having a racehorse? I reached out to West Point Thoroughbreds about the partnerships they offer. They had a 5-percent interest in a 2-year old colt available. Even better, he would be racing nearby in Maryland. The day I was going to fill out the paperwork, I was informed the colt was injured, and wouldn’t be available. Oh boy. Maybe this just wasn’t meant to happen. Lilly is back in work, preparing for the upcoming show season. I am enjoying riding again, and watching my daughter bond with Lilly. She is now tall enough to ride her. In mid-December, I received an email regarding the January 29, 2017, Fasig-Tipton horse sale in Timonium, Maryland. My husband, my sister, and I attended this same sale last year, when we were looking for a Thoroughbred for my sister to use in the Retired Racehorse Project. I stared at the email for a few seconds, noting the tab for the listing of available horses. I clicked it. The spreadsheet popped up on my computer screen. I stared at it for a few minutes, and then hit the column to sort by sire. I scrolled down the page until I got to the “T”s, and there I noted six yearlings that would be up for sale by Tritap, the stallion to whom I had bred Lilly. There were five fillies and one colt. Maybe since I couldn’t breed a racehorse, I could buy one. I scolded myself. What did I know about yearlings! Then I remembered the article I’d read in Mid-Atlantic Thoroughbred Magazine about Clovis Crane and Crane Thoroughbreds. Crane was an expert in this area, taking young Thoroughbreds and training them until they were ready for the track. Christmas came and went, and I was busy with holiday events, family time, and winter break. I didn’t have time to ponder this new information. In early January, the hard copy of the Fasig-Tipton catalog arrived in the mail, and I made my decision. I asked my husband Kelly if he would be okay going to the sale and “potentially” purchasing a yearling. With a smile of his face he said, “Whatever is going to make you happy.” I love this man. I reached out to Clovis Crane, and he agreed to help me. I went through the catalog, and I sent him a list of the yearlings I was interested in. Topping the list were the yearlings sired by Tritap; only the greys, of course. There were four of them. I then listed all the other grey yearlings in the sale, regardless of sire, and added the only Virginia-bred yearling (a bay) to stay true to my state, along with a grey 2-year-old in training. I ended my list with a short comment that I knew it was crazy to shop by color, but that was what I wanted to do. 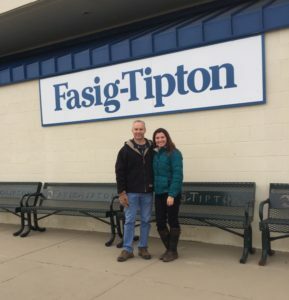 My husband, Kelly, my daughter, and I arrived at the sale in the morning. Clovis had spent the two previous days looking at every single horse in the sale, and paying particular attention to the ones on my list. When we met up with Clovis, he’d tossed most of the horses off the list for various reasons, including confirmation, way of going, and out of my price range. We narrowed the list to three yearlings, two by Tritap and one by Bandbox (another grey sire by Tapit). Clovis’ top pick of the three was the Bandbox yearling, Hip 125. My sentimental side wanted one of the Tritap yearlings, particularly Hip 126. The dilemma was that if I bid on Hip 125 and won, then I wouldn’t be able to bid on Hip 126. I decided it best to go with the expert. Which brings me to sitting in a seat in the arena for three hours, watching all the broodmares being sold until they got to the yearlings. Kelly and my daughter left to go to a pet expo taking place nearby. I refused to leave my seat. The first yearling of the sale, Hip 109, was called. Kelly was still gone. 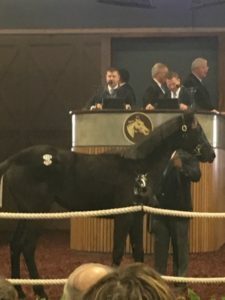 Each horse takes about two minutes to go through the auction process — the hands being raised, the auctioneer talking so fast you cannot recognize what he is saying. I watched the big screen that showed the prices as they went up for each horse sold. With Hip 109 sold, there were only 15 horses until Hip 125. I called Kelly. I texted him. Get back here, now! With four horses to go until Hip 125, Kelly walked into the pavilion and took his seat. Whew! I shot him a side look. My hands started to sweat. We noticed Clovis take a seat a few sections away from us. Hip 124 entered the walking ring. My phone rang. It was Clovis. “Are you sitting in a good spot to be seen by the bid-takers?” he asked. While he was asking, Kelly leaned forward and waved to Clovis. Oh no! The bid taker for Hip 124 pointed at Kelly. I grabbed his arm and pushed it down, looking exasperated over at the bid-taker. Kelly smiled, laughed, and gave him the no-go sign, not us. All eyes turned to look at Kelly, and laughter filled the pavilion. Oh, my beating heart! Hip 125 walked into the arena, the bidding started, and since Kelly now had this connection with the bid-taker, I elbowed him to raise his hand. The back and forth went until the price for Hip 125 was out of our price range. I was a bit relieved, but a bit anxious, too. I’d seen many people looking at Hip 126 that morning. Would I be out-bid on the one I wanted? Hip 126 walked into the ring, a spunky black filly. She walked around like she owned the ring, and I was in love. I elbowed Kelly. He wanted to wait until the bidding started. I elbowed him again, and he ignored me. Others started bidding, and my nerves were a mess. Finally Kelly signaled to the bid-taker. After a few back and forths, we were the proud owners of a Thoroughbred yearling, and under budget. I could breathe again. We gave the thumbs up to Clovis – but not too high, as the next horse had just walked into the ring. 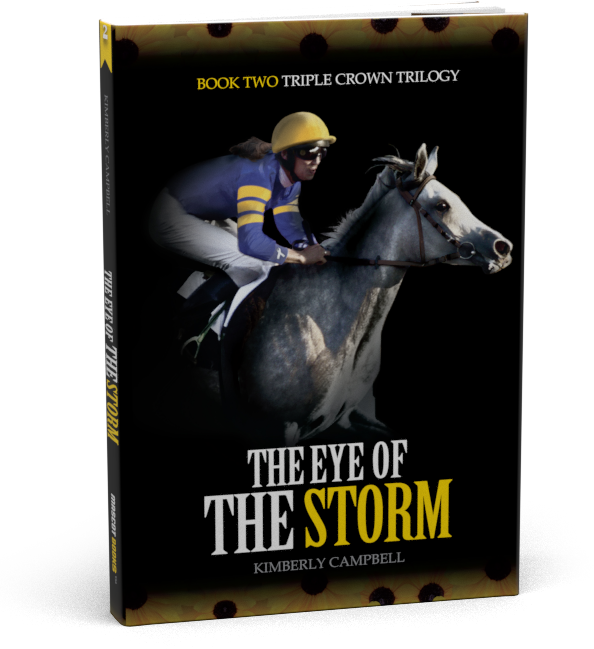 Now I would like to introduce you to the new chapter in my Triple Crown Dream. She doesn’t have a name yet. Her dad is Tritap and her mom is Skip the Glitter. It just so happens that she was the first foal born to Tritap. The date was February 1, 2016. Ironically, I included the information about Tritap’s first foal being born in my blog dated March 1, 2016 “Triple Crown Dreams – Take Two”. It gives me the chills that I have come to own this little filly that I had written about almost a year ago. Things happen for a reason? I hope so. For now she heads to Crane Thoroughbreds in Pennsylvania. I won’t see her often, but Clovis will let me know how she is doing. Her job for the next nine months is to mature and grow. At the end of the year, she will be broke to saddle and bridle and having a rider on her back. I look forward to keeping you posted on her progress! Our collective positivity will hopefully keep her healthy, and we can follow this journey together.